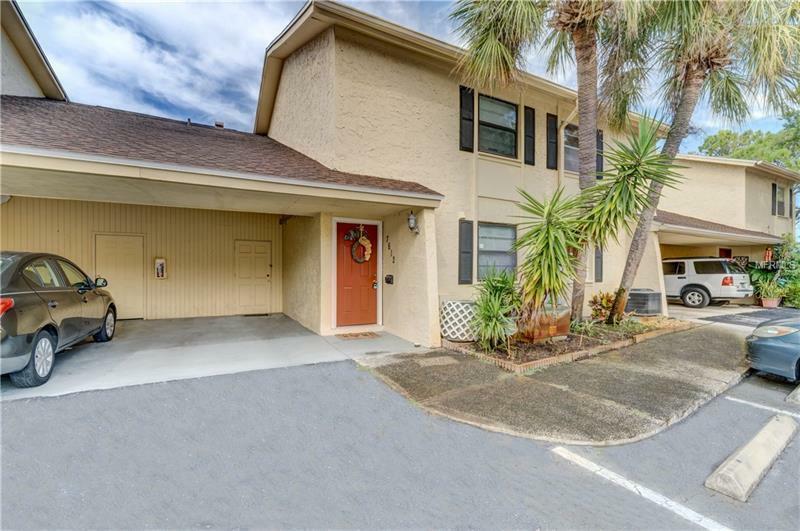 Fall in love with this updated and spacious, 1588 SF, 3 bedroom ground floor unit with carport! From the moment you enter, you will love the huge living & dining room with tray ceiling. The living room features a built in entertainment center, perfect for your big screen TV and laminate flooring. There is a large custom patio/deck off the living room, giving you a tranquil view of the trees and green space. The kitchen has been updated with stainless steel appliances, shaker cabinets and GRANITE counter tops . There is a large, 2nd floor, master bedroom with walk-in closet. Additionally, there is a half bath downstairs for guests with a pedestal sink. The additional bedrooms are located upstairs and feature large closets. The upstairs bathroom offers a shower/tub and has been updated with granite counter tops. Inside laundry area! All appliances convey. Additional storage closet located outside. Enjoy the community pools, recreation center & tennis courts. Terrific location with quick access to area schools, shopping and entertainment. Easy access to the Veteran's Expressway to quick commutes! Close to TIA, International Mall & Westshore district. Only 15 minutes to area beach. Won't last, so make arrangements to see it before it sells! Move in before the holidays & take advantage of homestead exemption!